[Jackzylkin] has posted an instructible showing, in detail, the process of creating a USB typewriter. He takes us through the process of disassembling the typewriter, mounting all the sensors where the little hammers strike, and wiring it all up to a custom board to interface with the computer via USB. While he is selling the board, the schematics are available if you want to build your own. We think the clickety-clack of a real typewriter could be very satisfying to the touch, though it might drive your co workers insane. The younger ones might also quiz you as to what that archaic machine is. We’ve actually seen this done before, way back in 2005.
cool hack, more so a work of art and not really useful though. What about the reverse: a typewriter fitted with numerous servos that “prints” text files? The perfect accessory for the Max Headroom fan. Artie has been using this at Warehouse 13 for years… I love all of the (pseudo)Retro technologies on that show! 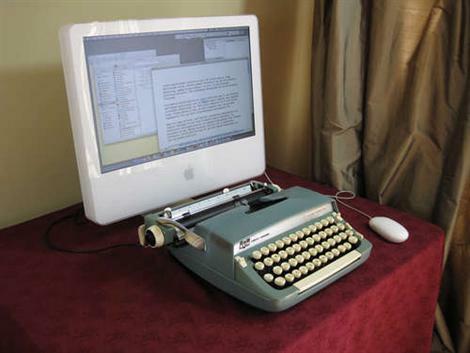 Nice hack but typewriters give me the fear. I used to work with a department full of middle-aged women who were terrified of computers and were forever banging on about how much better typewriters were. These people were ICT tutors BTW. I think I have that exact typewriter. Now, something like an IBM Selectric would be pretty nice, but an actual manual typewriter can be hell to type on. Neat project though. Oh, and by the way, the keyboard a previous commenter referred to, the one on Warehouse 13, is not a converted typewriter. It was made by replacing the keycaps on a Model M keyboard with the snipped-off keys from a manual typewriter. Google “steampunk keyboard”, that should get you the page. Wow – what a complete waste of time. There’s only one reason why anyone would want to type on a typewriter and that’s for authentic text. You’re taking a fully functional keyboard apart to fit into something which caused more cases of carpal tunnel syndrome that I care to mention. Well done. Next week, no doubt we’ll see a ‘hack’ where a perfectly good washing machine is taken apart and the drum is retro-fitted with a mangle. Can’t wait. Damn Xb0xGuru your right. Why should we hack stuff to do what we want. You can buy most of the stuff featured on hackaday from the store, why should you ever hack stuff to do what you want it to? Looks like the shills for the keyboard industry are out in force in this thread. @Anonymous: Byte Magazine did that to an IBM Selectric in the early ’80s with a bunch of solenoids. It was cool at the time, because the affordable printers of the day were all dot matrix. This was a way to get letter-quality output from your computer if you couldn’t spring for a daisy-wheel printer. You said: “What about the reverse: a typewriter fitted with numerous servos that “prints” text files? @Anonymous: Back in the 1970’s there was just such a thing, the IBM Selectric I/O Writer. It was a Selectric typewriter but underneath the base it was extended to contain the tilt/rotate solenoids. This is theunit you see in pictures of 1970’s IBM mainframe data centers. We had one and a hand-drawn sketch of how to interface it to an RS-232 port. I’ve got the old BYTE article mentioned above and from memory that was a unitthat fitted on top of the keys of a normal Selectric, not the I/O Writer. I’ve been wondering how hard it would be to use a microphone set (or attached) to a typewriter and have the computer process the input into text. I know that they’ve successfully implemented keystroke logging from keyboard sounds, I was never able to find the paper so I don’t know what kind of sample rate and quantity they used. Now we have a vintage typewriter keyboard, what should we use for a mouse? Xb0xGuru, “authentic text” just makes you sound like an arse. Another solution (possibly not practical) would be a webcam pointed at the typewriter hammers and some image processing. Too bad we can’t add a location that’s not on Yelp… Can’t you use Google Maps?